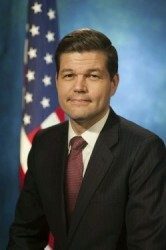 Aaron Wess Mitchell, Assistant Secretary of State for European and Eurasian Affairs, who is only in office for a few more days, met the Austrian Foreign Minister for a working breakfast in Vienna. Afterwards they visited Clemens Metternich's former office together with US Ambassador Trevor Traina and his wife. 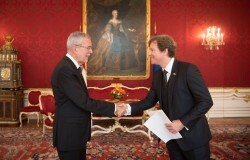 The new US Ambassador to Austria Trevor Traina presented President Alexander Van der Bellen with his letter of accreditation at the Vienna Hofburg. 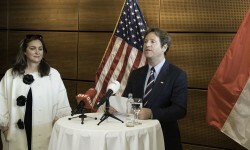 US Ambassador Traina Arrives in Vienna: "Austria is one of America's first friends"
The new US Ambassador to Austria, Trevor Traina, grandson of Wiley T. Buchanan, the former US Ambassador to Vienna (1975 - 1977), has arrived in Vienna with his wife Alexis. In his first statement, he underlined the close bilateral relations between the two countries: "Austria was one of America's first friends and we are here to remind everyone how important that relationship still is today - over 180 years later."